In spring 2014, students and faculty from Messiah College and Harrisburg University of Science and Technology initiated a collaborative digital project to place the entire population of Harrisburg, Pennsylvania, and the neighboring (historically) immigrant town of Steelton, on contemporary historical maps from the early twentieth century. Through class exercises and projects, work study positions, and volunteer efforts, history professors and students input the entire population of these communities from the decennial censuses of 1900-1930, including all relevant census fields such as race and birthplace, immigrant status, occupation and industry. At the same time, and in conjunction with this work, GIS students and faculty at both institutions digitized contemporary maps of Harrisburg and Steelton. The result of this combined labor is a massive demographic database of over 300,000 names, linked to over 10,000 individual residences in a GIS. Teams have also begun to incorporate (via a unique property number) other large data sets such as church membership rolls, names and occupations from city directories, and property values for the same time span. And history faculty have mined newspaper databases and recorded oral histories to fill out the picture of the city. The Digital Harrisburg Project has been a boon to our institutions, giving our history students new digital proficiencies in databases and GIS, and our GIS and computer science students an opportunity to tackle historical problems, while also creating real and enduring collaborations across departments and institutions. As importantly, the project has generated a new and powerful historical resource for understanding and rethinking major phenomena in U.S. urban history. The integration of multiple sets of information encoded at individual street addresses in GIS has created one of the highest-resolution digital images of an early twentieth century urban community transformed by immigration, population growth, and city planning. Plotting the population through time (1900-1930) sheds light on the dynamic patterns of human mobility and migration that were characteristic of communities at the junction of major roads, waterways, and rail lines. The datasets also have allowed us to reconsider the demographic, racial, and spatial aspects of Harrisburg’s successful urban reform movement, outlined most clearly in William Wilson’s pioneering work on The City Beautiful Movement (1989). In this session, we provide an overview of the history of the Digital Project within our institutional contexts; outline the nature of the data sets including the geospatial framework; highlight the potential of the data for reconsidering broad issues of historiographic debate; and showcase our recent efforts to replicate the data for other cities and places through new technologies (computer vision). The goal of this session is to publicize the results of the project in anticipation of the imminent public dissemination of the demographic and geospatial datasets for purposes of research, and to highlight how others might engage in a similar project within their own communities. We also hope attendees will provide us feedback as we consider next steps. Participants included James LaGrand (Messiah College History Department), David Pettegrew (Messiah College History Department), Albert Sarvis (Harrisburg University of Science and Technology), David Owen (Messiah College Computer Science Department), and Lisa Krissof Boehm (Urban Studies at Bridgewater State University). Digital Harrisburg as a pedagogical framework to help Messiah College history students develop digital proficiencies and make historical arguments with technology; and to introduce computer science and GIS students to historical applicatons of datasets. Digital Harrisburg as a public humanities project designed to engage different audiences in the city. The audience–a combination of digital historians and Pennsylvania history experts–was small. But they were also very engaged. Commentator Lisa Boehm praised our work, told us to be “less humble” about it, and offered some great suggestions for moving forward. Click here to learn more about the Digital Harrisburg Initiative. Over at the most recent issue of Common-Place, Temple University historian Jessica Roney discusses her recent book Governed by a Spirit of Opposition: The Origins of American Political Practice in Colonial Philadelphia. I first came across the concept of a “civic technology” in Johann Neem’s fine book, Creating a Nation of Joiners: Democracy and Civil Society in Early National Massachusetts. The concept resonated powerfully with me as an important intervention in how we think about voluntary associations. The eighteenth-century men of Philadelphia I describe both borrowed and departed from an array of religious, craft, and political organizational strategies as they sought to find an effective way to organize toward a particular end, and to keep their members willing to invest their time, energy, and resources. Many of them failed. We know more about the successes because they left behind a better paper trail, but there in itself is another reason to think of voluntary associations as a technology.Living in the early twenty-first century as a new generation of technologies make possible popular mobilization at a speed and scale never before dreamed of, it is easy to take for granted or find it self-evident that people organize together. The things they use to do so, and especially those instruments that make it possible—the Internet, cellphones, the many and ever-changing platforms of social media—those are the technologies. In a similar fashion in the eighteenth century, technological changes related to the rise of print culture facilitated and encouraged collective organizing in new ways and on a new scale. But if we step back and remember that the format of voluntary association itself had to be invented, that it was not self-evident, that it took time and trial-and-error, we can appreciate that the elaboration of successful forms of voluntary association was itself a kind of technological innovation. As organizers throughout the Atlantic world sought to mobilize men (and by the end of the eighteenth century, women) outside the parameters of church or state, they borrowed heavily from the strategies of earlier voluntary associations that worked. In Philadelphia, men found it easier and faster to adopt a model that had already been tested, rather than generate their own from scratch. All twenty or so colonial Philadelphia fire companies, for example, copied, often verbatim, the articles of association from the first successful company, the Union Fire Company, founded in 1736. The blue-print, as it were, circulated freely, allowing a diverse range of men over a long time span to adopt and adapt the technology to their own needs. Innovations along the way then became available to still-later groups as they studied the available models and selected those strategies their organizers thought would best meet their objectives and keep the membership energized. The civic technology of voluntary associations, then, was never proprietary. Philadelphians borrowed from England and Scotland, from their churches, from joint-stock companies, and from one another as they created their own innovative strategies tailored to their own needs. That this technology was indeed civic stems from two sources. First, the preponderance of organizations—at least in Philadelphia—that were the most effective at mobilizing and retaining members over long periods of time had at least some explicit desire to contribute to the public good. Second, even where organizations were less focused on explicit civic functions, their members understood their associations still to contribute to a civil society—meant both in the sense of one characterized by polite sociability and as a collection of citizens operating outside the scope of church or state. Emma Hart is Professor of History at University of St. Andrews. This interview is based on the paperback release of her new book, Building Charleston: Town and Society in the Eighteenth-Century British Atlantic World (University of Virginia Press, 2015). JF: What led you to write Building Charleston? EH: I often get asked this question as many Americans wonder how a British person ended up writing a book about Charleston. Like many first books, this started off as my PhD dissertation. I went to graduate school with the intention of researching the artisan economy in early American cities. My supervisor alerted me to the fact that both Charleston and Newport had received the least attention from historians. I decided to visit Charleston first, and never made it Newport. Coming from the UK, the combination of palmetto trees and Palladian architecture was really striking and, as I soon realized, symbolic of so many of the dissonances in Charleston’s long and eventful history. Even as I finished the PhD thesis, however, I realized that the people I was looking at were part of a larger group of white townspeople, who all used their labor, and that of their enslaved Africans, to accummulate wealth and property in the city. Building Charleston became a story about these men and women who were neither planters, enslaved field workers, nor plain folk, yet still made a major contribution to the character of colonial South Carolina. I also came to feel like a cheerleader for Charleston, which was often overlooked by historians as an important colonial city in favor of Boston, Philadelphia, and New York, even though it grew almost as fast as these northern towns. JF: In 2 sentences, what is the argument of Building Charleston? EH: In the eighteenth century Charleston was not merely a vehicle of South Carolina’s plantation economy, but rather was a fully functioning participant in the creation of a British Atlantic urban world. Among other things the growing city fostered the emergence of a middling class of people, who strongly shaped urban culture, politics, and economics, in ways that made the place look very similar to contemporary cities in provincial Britain. JF: Why do we need to read Building Charleston? EH: I hope that readers will come away with a new outlook on how important towns were to British America’s plantation societies during the colonial era. Like Kingston, Jamaica, and Bridgetown, Barbados, Charleston was a dynamic city, whose economy brought wealth to a distinct sector of society. What is more, enslaved African people were often foundational to these urban wealth-creation activities. For example, enslaved carpenters and bricklayers were instrumental in the speculative building craze that gathered pace after Charleston’s major fire of 1740. Owned by white builders, such people saw none of the profits, however, which lined the pockets of their masters who used this wealth and property as the basis of a middling social status. Thus, the story of America’s entrepreneurial middle class starts in the eighteenth century, and is as much a southern story as it is a northern one. What is more, slavery was right there at the inception. The important role of urban society in shaping South Carolina society at this time also reminds us that we shouldn’t read the state’s archetypal antebellum southern character back to the eighteenth century as it wasn’t always so. There was a time in the eighteenth century that Charleston’s importance gave the region a much more urban quality, and townspeople even challenged the authority of the plantation elite. EH: I decided to become a historian when I was only 13 years old – I had a very dynamic history teacher at school who persuaded me pretty early on that my future lay in the past! When I got to university I started to do more eighteenth century history, which I thoroughly enjoyed. I liked the rambunctious nature of eighteenth century society, which is embodied in so many of William Hogarth’s pictures. When I got the opportunity to do a special topic on Revolutionary America, I knew I’d found my historical home – early America was not only more rowdy than Europe, it was also a society that grew incredibly quickly, and incorporated so many contradictions of slavery and freedom, success and failure, and violence and refinement. Once I’d decided to commit myself to an academic career by starting a PhD, there was no question about which field I’d study. EH: I’m working on a history of marketing in early America, tentatively titled Trading Spaces: The Early Modern Marketplace and the Creation of the American Economy. The research continues my fascination with how humans interact with space and landscape in past societies. I’m trying to unearth the places, customs, and institutions that characterized ordinary peoples’ daily trading practices. American historians have usually portrayed “the market” as an ideological abstraction. However, the majority of early modern people encountered the market as a physical space entangled in local social and economic relationships. I think that it is only by investigating the early American market place on these terms can we grasp the foundational role of the colonial era in the long-term formation of an American market economy. This is an interactive bibliography of books published about religious history in a particular American city. Its aim is to show where historians of American religion have focused their attention—and where they have not. Click on a city and see what has been written about the religious history of that city. Or you can move the timeline to see the historiographical development of urban religious history over the last half-century. Back when I thought my dissertation would focus on religion in Omaha, I took a keen interest in American religious history books that had been framed to fit within the context of a specific city. With books like Robert Orsi’s Madonna of 115th Street, Wallace Best’s Passionately Human, No Less Divine, Margaret Bendroth’s Fundamentalists in the City, Mary Lethert Wingerd’s Claiming the City, and Matthew Bowman’s The Urban Pulpit in the back of my mind, earlier this year one of the digital mapping projects from Lincoln Mullen inspired me to think about the possibility of combining mapping with bibliography. The idea was to make a map of city-based studies of religion so that someone could click on a location — say, “Chicago” — and up would pop a list of books dealing with religion in that city. Unfortunately, my CartoDB mapping skills were simply not up to the task. Fortunately, though, Lincoln offered to use his digital wizardry to make the bibliographic map a reality. Thanks to Lincoln’s efforts, I’m proud to announce that our little project is now ready for public use. The end result is even better and more robust than I had imagined: easy to navigate, searchable, clean, and crisp. Although the difficult work is done, now we need your help. Our initial set of data includes only about 170 books. If you have time, browse over to the map and help us make it more complete by letting us know what books we have missed. 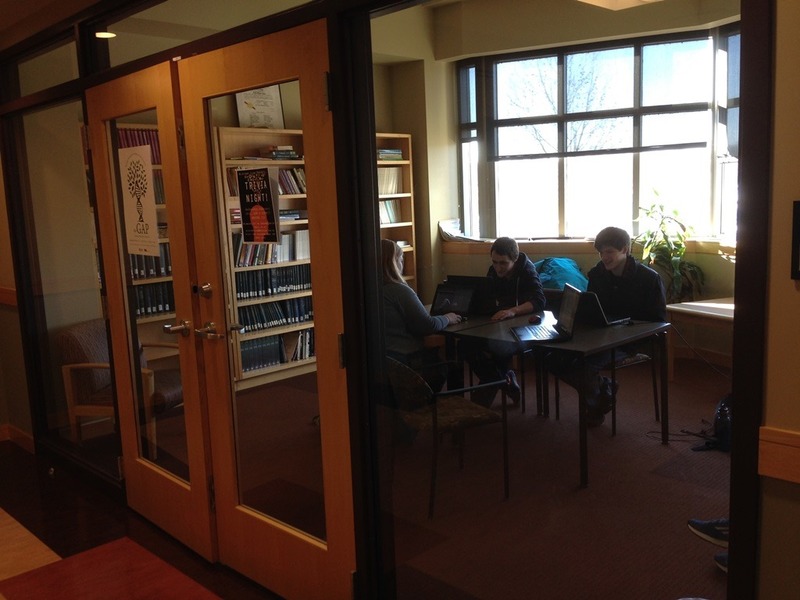 DHI Fellows hard at work in the Messiah College History Dept. Some of you who read The Way of Improvement Leads Home are familiar with the Digital Harrisburg Initiative. If you still don’t know about the project, let me bring it to your attention here. DHI is an interdisciplinary digital history project housed in the School of Humanities at Messiah College and run by my History Department colleague David Pettegrew. It attempts to tell the story of Harrisburg, Pennsylvania from roughly the 1880-1930. Like most digital history projects, DHI is a work in progress. David and his team of historians, GIS experts, undergraduate fellows, and student researchers continue to add new information to the site. 1. The Digital Harrisburg Working Group (Rachel Carey, James Mueller, David Crout, and I) continue to plow forward in making progress on the 1900 and 1910 census. We lost our wonderful GIS tech, Rachel Morris, to an early graduation, but we’ve since gained a new member David Crout. Rachel is digitizing the 1910 census for Harrisburg, James is working on normalizing the 1900 data, and David Crout is working on the triennial tax assessments. You’ll hear more from all of our group during the semester. 2. John Fea’s class in Pennsylvania History at Messiah College is working on church rolls for Pine Street Presbyterian and St. Patricks Cathedral parish at the turn of the 20th century as well as the relationship of these communities to the City Beautiful movement. Once these membership rolls are collected and digitized, we’ll be able to plot members of these different communities according to their area of residence, and analyze membership against criteria like ethnicity, birthplace, and occupation, among others. 4. Professor Jeff Erikson is working with several students this semester on a directed study related to GIS. His students are georeferencing and tracing the 1902 Sanborn maps for Steelton, the community immediately south of Harrisburg. Since Rachel Carey has keyed the census data for Steelton, completing this will be a first step in understanding the large community of immigrants in Harrisburg 120 years ago. 5. Professor Albert Sarvis of Harrisburg University, in the meantime, is working with geospatial technology students on georeferencing the Sanborn maps of 1905 for Harrisburg. Once these are completed, we’ll add later years of Sanborn maps for the city. 6. Over at Jump Street, Andrea Glass is directing a group of capable high school student interns in digitizing images and documents from the Harrisburg City Archive. I’m hopeful that we’ll start to crowdsource some of the photos without provenience at this site to encourage identification. For some possibility, see the incredible site dedicated to the Philadelphia City Archive. We’re about to launch an Omeka site devoted to Harrisburg history that is a bit broader than City Beautiful. 7. We’ll be partnering this semester with Professor Michael Barton’s class at Penn State Harrisburg, who will analyze the census data for the Eighth Ward. This is a boon to us since Barton has been a pioneer in telling Harrisburg’s story, and his students produced some of the earliest work on the subject. See, for example, the excellent website about the Old Eighth Ward created and maintained by Stephanie Patterson Gilbert. Look for some interesting stories and historical analysis. 8. Since launching this site, I’ve heard from a number of people who are also working on digital projects related to Harrisburg. I think of Robert Shoaff, who is doing interesting work with city youth to build up a digital 3D model of Midtown called the Midtown Minecraft Project (see the blog here). There are others who have contacted me recently about their interests in contributing to the initiative. There are a number of other exciting projects that are just developing such as public memory harvests and gaming, which we’ll publicize when the timing is right. Stay tuned. Beyond these endeavors, a number of presentations are in the works. We’ll keep you updated. If you would like to support our initiative, visit the Keystone Digital Humanities Conference page and follow the link to vote for including our project in a major DH conference in July. Things are happening quickly with the DHI. It will be interesting to see where we are a year from now. Catherine McNeur is Assistant Professor of Environmental History and Public History at Portland State University. This interview is based on her new book, Taming Manhattan: Environmental Battles in the Antebellum City (Harvard University Press, November 2014). JF: What led you to write Taming Manhattan: Environmental Battles in the Antebellum City? CM: Before I got started on Taming Manhattan, I had read a passing reference to New York’s hog riots in the early nineteenth century. I was amused by the fact that pigs freely sauntered through the streets, let alone that they were the cause of riots. My reaction, I’ve come to realize, reflects that like many others I make assumptions about what belongs in a city and what doesn’t. As I began to look into these riots and several other environmental battles, I found that the nineteenth century was a moment where these lines between urban and rural were being drawn. The act of drawing those lines legally and culturally was highly contentious because many stood to lose quite a lot as the municipal government pushed livestock and agriculture out of the city and made it harder to earn a living from urban land. JF: In 2 sentences, what is the argument of Taming Manhattan: Environmental Battles in the Antebellum City? CM: As cities such as New York transformed beyond recognition from the influx of immigrants and the construction of new buildings, residents found in the urban environment a way to seize control of the seemingly uncontrollable city. While the battles that erupted over the use of the urban environment often led to a tamer, cleaner, and more regulated city, they also amplified environmental injustices and economic disparities. JF: Why do we need to read Taming Manhattan: Environmental Battles in the Antebellum City? CM: Nowadays there’s a lot of talk about how to make cities sustainable. Taming Manhattan shows us that “sustainability” meant something completely different in the nineteenth century and will likely mean something completely different in years to come. Today keeping backyard chickens or rooftop beehives is trendy and acceptable by a range of different people and municipalities. You can even buy a $100,000 chicken coop from Nieman Marcus if you were so inclined. However, 150 years ago it was far from fashionable to keep livestock or tend a garden and wealthier New Yorkers actively tried to bring about the death or urban agriculture. In their eyes, getting rid of local food sources would make the city healthier and more sustainable. What we need to remember is that attempts to improve cities usually come with significant social costs that we often overlook. CM: I actually majored in urban design rather than history when I was an undergrad. One of the courses I took for that major, though, focused on the architectural history of New York City. Each week the professor led us on walking tours through a different neighborhood, discussing the specific histories of buildings and communities. Having grown up around New York, I was used to the city and its built environment. In fact, it seemed like more of a backdrop than anything else. This class, however, opened my eyes up to the wealth of stories about people, politics, economics, and environments that led to something as simple as the design of a city block. As I got further into that major, I researched the work of an architect in the early republic. I fell in love with the detective work necessary in the archives and there’s been no turning back since. CM: Taming Manhattan involves New Yorkers fighting over sizable animals, like sows among other things. For my next project, I’m interested in looking at how early Americans reacted to much smaller creatures from amoeba to insects and what that meant for the way they understood their own bodies and environments. While today we see a budding respect for bacteria as people increasingly embrace probiotics and newspapers report on the importance “good bacteria,” the fear of tiny things has yet to go away. I’m interested in seeing how nineteenth-century Americans confronted these fears. JF: Good stuff, thanks Catherine! Last weekend I got some time to watch this great lecture by Yale’s Jon Butler on religion in modern Manhattan. Contra Max Weber, Butler argues that Manhattan is an “enchanted” city. I assume that the lecture stems from Butler’s forthcoming book on the subject. Butler’s lecture is worth your time. I know very little about georeferencing and digital mapping, but I have become fascinated by the whole process through my affiliation with a new digital project we are sponsoring at Messiah College. We call it Digital Harrisburg. On Tuesday I was involved in a presentation about Digital Harrisburg to about thirty Messiah faculty and staff. I watched as my colleague David Pettegrew showed how his digital history course, working together with Geographic Information Systems (GIS) classes at Messiah, Harrisburg University, and Harrisburg Area Community College, was able to link the 1900 census record of Harrisburg to contemporary digital maps. After attending this session, and hearing David talk about this project over the course of the semester, I was particularly interested in Chris Cantwell‘s latest post at Religion in American History: “Lost Landscapes of American Religious History.” Cantwell teaches public history at the University of Missouri–Kansas City, but he is still finishing up an exhibit on the religious history of Chicago at the turn of the 20th century for his old employer, The Newberry Library. The exhibit is called Faith in the City: Chicago’s Religious Diversity in the Era of the World’s Fair. But even more pervasive, and more revealing, is the ways in which today’s built environment reveals the enduring privilege of race and class upon the built environment. This is most easily seen by the fact that most of the sites of Chicago’s religious history that still exist are those that remain in the hands of their founders. Holy Family Church, for example, has remained at the intersection of Roosevelt and May Streets for nearly a hundred and fifty years. The congregation has survived several fires and a neighborhood that has turned over repeatedly throughout the century because it has had the resources to sustain itself. Many storefront churches and evangelical rescue missions, however, are all gone. Yet the ways in which power and privilege manifest themselves in the presence and absence of go even deeper than the survival of buildings. It also occurs in the seemingly innocuous act of assigning geocoordinates. Data is supposed the be the great leveler. We’re all ones and zeroes to the computer. But level of precision one can get in assigning coordinates is deeply inflected by race, class, and gender. For example, Chicago Sinai Congregation’s 1890 temple no longer exists. But the fact that the neighborhood it was located in remains relatively stable means that translating its 1893 address into 2014 coordinates is relatively easy–even if that space is now luxury condos. But to try and locate the coordinates of the city’s black churches has been one of the most depressing research tasks I’ve undertaken. The intersections, streets, and alleyways that once pulsated with the rhythms of black Chicago are in many instances gone. And not just the buildings. Streets have been removed, intersections torn up, and alleys completely abandoned. Assigning these sites geocoordinates has involved a lot of estimated guesses, and in many instances I’ve been forced to simply place a church in the middle of the street because the data does not suggest which corner it was on. It’s like witnessing the traumas of the twentieth century in longitude and latitude. Robert Putnam of Bowling Alone for years has been bemoaning how the Internet is going to separate us and how we’re losing the social fabric of mixing in public. But he’s done recent work that is much, much less discussed, because it’s really uncomfortable. He’s found that when you’re living in a city where you’re a minority, you’re probably going to hunker down. You’re probably not going to mix much with your neighbors. You’re probably going to spend a lot of time watching TV. Confronted with high degrees of cultural diversity, people, for the most part, don’t seem to step up to the challenge and meet their neighbors. In many ways, they hide from them. A lot of cities that have the highest degrees of civic participation are pretty ethnically homogenous. I would love to be able to say, yes, cities are serendipity engines, and if you just fully embrace the city, and take advantage of all the cultural richness and diversity that’s available there, you’re going to find a way to get as much of that encounter as you get from having the Internet. But there’s no guarantee that you’re going to do it in the city. Check out the pics here, if you can take it. Check out these maps courtesy of the Pew Research Center. In case you had not heard, the city of Harrisburg, PA is facing some serious financial difficulties. Back in October the city council voted to file for bankruptcy protection, but their request was denied by a federal bankruptcy judge. At the moment, the city is $310 million in debt. Most of the debt comes from a failed attempt to upgrade a city trash incinerator. In order to put a dent its massive dent, the city is holding an auction of historical artifacts. Most of the artifacts were collected by former mayor Stephen Reed as part of a plan to establish an African-American history museum, a sports history museum, and a Wild West museum as a means of raising revenue for the city through tourism. The city owns about 8000 artifacts, including a Jesse James “Wanted” poster and a pistol that belonged to Doc Holiday. Agritopia planners offered potential residents 176 home design variations ranging from 1300 to 4500 square feet, allowing people with a broad range of needs and resources to find a home in Agritopia. When designing the homes, the team committed to eight design principles: to reduce physical barriers to relationship; to reduce social/economic barriers to relationship; to promote sharing; to promote a simpler life; to promote the foundation of a true neighborhood; to choose style and beauty over size and sizzle; to honor agriculture; and to create a balanced project. These design principles served as the foundation for all decisions regarding architectural style and land use for the urban farm community. Agritopia must be understood within a larger social context. The Johnston’s vision for their unique community is not the first to emerge from the desert southwest. For hundreds of years people have attempted to redefine community life and to create alternatives to the troubling urban conditions that have evolved in many sprawling Sunbelt cities. Phoenix itself is on the verge of urban crisis. Two questions loom large in the coming years: One, how will Phoenicians, in creative and sustainable ways, respond to the growing concern over food access and local food production? Secondly, how will Phoenix residents create viable correctives to what some consider the aggressive, monotonous, and isolating postwar suburban development in the Salt River Valley? Agritopia, in a morass of tile and stucco, provides its own answer. The planners created a “middle ground”—one that incorporates urban living and agricultural production—reflecting a commitment to satisfying the human need for community, and also to meet the very physical needs of its residents by providing locally produced food and opportunities for residents to grow their own food in community gardens. By looking at Agritopia—its successes and its failures, its novelty and its tradition—we can learn about the ways in which people are thinking innovatively about organizing urban life in Phoenix. Perhaps Agritopia can provide a blueprint for other valley neighborhoods that must build vibrant and healthy communities in order to prevent the erosion of agriculture and kinship in a state founded on both.